What a Wedding Carly and Kieran had at Leicester Guildhall, From the moment Carly arrived at her wedding venue, I knew today would be ok, she was like a breath of fresh air, an absolutely perfect bride, from beginning to the end of her Leicestershire wedding! The brief for the wedding was informal and relaxed, Well with Carly as the Brides and Kieren as the Groom along with myself as the photographer, I don’t think there was any fear of it not being stress free. I would like to say a big thank you to the venue staff at Leicester’s Guild Hall and St Martins House who were lovely to me! I have to say both the Ceremony room at the Guild Hall and the Lovely large open beautiful room at St Martins House was great to photograph in! Also the fabulous Simone from Pristine events who mage the room look so beautiful and Simone was so Glamorous! 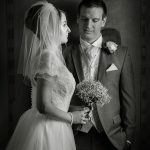 I love this set of Images, the light on a few really makes me happy, especially as the venue mentioned that in all the years he has been working at The Guild Hall no photographer has used that small area for images and could they use them in the next Wedding Brochure ! during our little Walk we bumped in a Portuguese Television Crew, they interviewed these newly wedds and Keieran’s prediction for Leicester City was spot on, have a look at the TV footage Here Carly and Kieran balance their wedding perfectly, were their for the family in the day time, but the evening was for them and their friends, to party along with the wonderful band “Fire and Skill” all I will say is ! I had to drag myself away, with songs by the Jam, The House Martins, Kasabian and The Stone Roses, I really didn’t want to go home!